As far as the beauty industry is concerned we are already well into 2018; you may have noticed all the new product launches and spring colours arriving at a makeup counter near you. I love the spring releases but remove my rose tinted specs to try to figure out which will stand the test of time before I buy anything. Before I launch into reviews of the new crop here’s a round up of last year’s standouts. Last year when I wrote “We Are Sixteen Going on Seventeen” I wondered how long I’d be able to carry the numbers theme. So far, so easy. 2017 gave me more than seventeen makeup and skincare finds to rave about so though the last year may have been s–t in many respects, it was a bumper year for beauty. I’ve gone over the edge of seventeen but maybe you’ll find something good you may have missed. The List consists of the things that rocked my working and non-working world in 2017, but not necessarily in that order. NARS AUDACIOUS LIPSTICK IN ANITA -the Holiday Edition of Anita, in a gold ManRay inspired case was an immediate hit with me when I tried it and not only because of the excellent lighting! [sidebar: watch out for that, lighting in beauty departments is invariably awful so always go outside for a second opinion]. 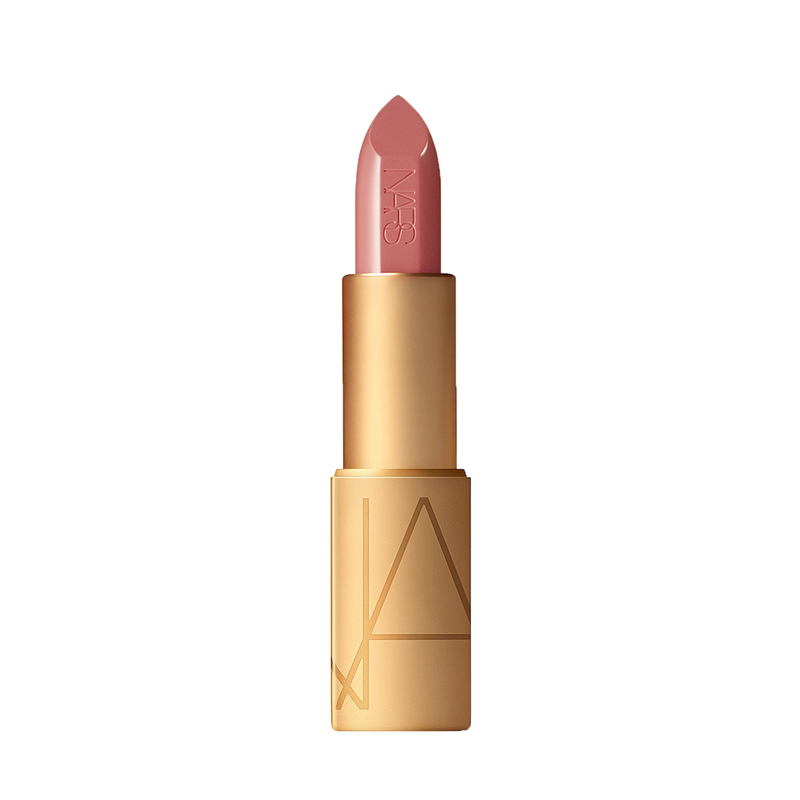 This mid-toned pinkish neutral, full coverage lipstick in a very good velvety matte texture is flattering on everyone (it is, I’ve tried it). Also loved the brilliant packaging so the ManRay edition had to be mine…well it matches my glasses holder doesn’t it? My JADE FACIAL MASSAGE ROLLER which I found when I went to grab a juice on Vancouver’s Main Street. Not sure why they were in Juice The Two Of Us but of course I bought one and now wish I’d bought all three because I don’t see them around often. The rollers are a beautiful and calming tool for facial massage. Keep it in the fridge and roll away tired and puffy faces in the a.m or whenever your need arises. The rolling technique stimulates facial muscles and aids in lymphatic drainage hence the de-puffing. Asian tradition believes jade holds special healing properties and draws out negative chi: as it turns out, moderns scientists discovered that jade is a natural transmitter of far infrared rays so it does in fact warm up and boost microcirculation in the skin. I recently heard the term “jadonic” from a top London facialist confirming the trend towards jade in skincare. My roller is double ended so very handy but Yu Ling Rollers Jade Facial Roller (Medium) and Yu Ling Rollers Jade Facial Roller (Small) can be had for £30 combined which isn’t bad for a lifelong beauty tool. Plus, it’s green and I went mad for green in 2017. My favourite natural beauty tool. CHARLOTTE TILBURY INSTANT MAGIC FACIAL DRY SHEET was another spring 2017 arrival. It made a big impact as the first dry mask in the mainstream market using new beauty science tech to deliver professional results in fifteen minutes at home. I’m a big fan of CT products so here I am with yet another Tilbury recommendation. As the UK’s fastest growing beauty brand (a world takeover is imminent, CT shops popping up all over the place) her product development department keeps hitting it out of the park and this one was pretty amazing. Inspired by the technical innovations of Korean beauty, it has all that tech stuff going for it and works with ingredients such as vitamins, floral extracts, peptides, oils and butters to reduce wrinkles, smooth, brighten, lift and hydrate your skin. There’s a load of science here so have a read about it on the site. Because it’s a dry mask it doesn’t harbour bacteria AND you can use the same one up to 3 times saving some dosh. Win for face, win for wallet. A single mask is £18.00 (make sure to pack it back up tightly so you can use it again, I put the whole pack in a large ziplock). It’s one of the scarier -looking masks around but isn’t that part of the fun? bENEfIT HOOLA CONTOUR STICK – this one arrived in February 2017 just when we needed a boost of bronze in those paler months. Taking their award-winning, amazing Hoola powder bronzer and turning it into a cream formula was an inspired beauty move by benefit and though I’m not mad about their brow obsession, this San Franciscan company does cheeks very very well. Using a contouring stick is the easiest way to contour, if you have to. I do it sometimes, but not in that weird ashy way. This one has a really good SLIGHTLY cooler tone, but because it’s based on the traditional bronzer colour, it’s not ugly ashy, which makes it a very good contour colour for light to medium skins. The formula blends very easily which is all important because having two big stripes under the cheekbones is not the way to achieve more dimension in your life! I have seen that on the street. Not even joking. KEVYN AUCOIN THE VOLUME MASCARA is a tube mascara, which are essential for bottom lashes IMO- they won’t smudge or come off until you want them to. My favourite UP UNTIL NOW had a great formula but the applicator brush was too big to get to those little lashes and deposited mascara on the skin under my eyes almost every time. Very annoying. I had to use the mini brush of a different mascara to put it on which became quite a complicated procedure! When it ran out I needed a new one but couldn’t find the brand in the UK. Went to SpaceNK in Brighton and was directed to this beauty of a tube mascara……with the PERFECT BRUSH. Tiny, dense and easy to handle, it gets to those bottom lashes and does the bizz. Now I don’t leave home without wearing KEVYN AUCOIN The Volume Mascara which only comes in black. My other one was dark brown but until they fix the brush issue I’m sticking to this one. MICRONEEDLING or DERMAL ROLLING was my skincare revelation of 2017. No porcupines were injured in the development of this practice, at least I don’t think so, but as forms of it go back centuries we cannot be entirely sure. The modern version of microneedling, aka dermal rolling, using a tool with medical grade titanium alloy needles, elicits a response from the skin to heal itself by producing collagen so the treatment is known as collagen induction therapy. My personal results were so good (glowing skin, softening of lines, better skin tone and texture) and natural that friends commented without knowing what I’d done. So impressed was I that I trained in the therapy and am now a certified microneedler. The most effective course of collagen induction therapy consists of six sessions (a week to ten days apart) with a .5mm needler which is considered a “medical” tool and can’t be purchased for home use. You can very easily buy dermal rollers needling with shorter needles but as they do not reach as far into the dermis the results won’t be the same. After your six sessions, one more six months later is all that’s required for the year. Not bad and better than injectables of toxin, n’est-ce pas ? M.A.C “PROUD TO BE CANADIAN” LIPSTICK arrived in the summer to honour Canada’s 150th birthday – and as I’m a half Canadian, half British and was living in Vancouver for the celebrations on July 1st, I would have been very remiss not to participate! M.A.C (Makeup Art Cosmetics in case you didn’t know) is Canada’s proudest beauty export, and was once a small Toronto based company that started making neutral matte lipsticks in the mid 80’s when nobody else did. The rest is history. It’s also where I started my (surprise) makeup career. Sadly this red isn’t part of their regular stock which is a shame because it was a beautiful true red and inspired patriotism, eh? DECIEM “THE ORDINARY VEGAN HYALURONIC ACID 2% + B5 – good segueway into another great beauty product from Canada and a very definite Beauty Bargain Alert! This Toronto based skincare line is anything but ordinary and their vegan, cruelty-free hyaluronic acid is a no-nonsense hydrator from a no-nonsense company. Not funny that it took me a trip to Covent Garden to find it. Deciem and it’s ten (hence the name) brands which include The Ordinary, NIOD, The Chemistry Brand, White RX and Hylamide (that’s only half of them) get to the root of essential skincare. Last year on a trip to the UK I was on a mission to find a pure hyaluronic. In Canada and the states you can walk into any health food store and find it but I was a bit miffed that it was so hard to find in England, certainly not on any High Street. The times they are a-changing. Enter Brandon Truaxe and his extraordinary vision for skincare. The store in Covent Garden’s Beauty Quarter which opened in July 2017 (there’s five more across London) offers complete skincare at very competitive pricing, the 2% hyaluronic + B5 is a mere £5.90 so no wonder it sells out. Hopefully you all know by now that hyaluronic acid is essential for hydrated skin and hydrated skin equals youthful-looking skin. HA can attract up to 1000x it’s weight in water and there’s lots more science behind this formula with added B5 so it’s worth a visit to one of the stores if you want to change up your routine without breaking the bank. K BEAUTY shook up my beauty world in 2017, in a good way, not in a bad earthquake way, though there were a couple of nasty tremors in Vancouver last year. “K Beauty”, the generic term for Korean beauty products, packages really good product in a very appealing way so it’s ideal for teens first makeup forays and for grown-ups because it puts the fun back into your makeup bag. The easy eye tints from By BelleMe were a game changer for my kit last year, delivering quick and beautiful summer makeup, wonderful on their own or with a bit of a cat liner for nights in tropical places. Or anywhere else. Read the post I did on the curated selection of K Beauty that Nordstrom did last year if you want to know more. CHARLOTTE TILBURY INSTANT EYE PALETTE was initially released amidst a huge frenzy, as per usual for something new from Charlotte, for a twenty-four hour window only on Sep 21st. Savvy marketing move to raise the instafrenzy and bloggerbuzz which was to make it one of the must-have makeup products of the year. The palette was available proper again in mid-October. Is it worth the hype? Containing twelve shadows in a mix of shimmer and silky matte textures, and in the predictable “prime, enhance, pop” Tilbury format you get the makings of four looks but hopefully you know to ignore that rule and apply them to best suit your eye shape and size. I think it’s a useful makeup kit collection for makeup fanatics and makeup artists alike and at £60.00 for twelve shadows you get quite a lot of bang for your bucks. Or pizazz for your pounds. Split the cost and share with family, friends or flatmates, depending on who’s going to the desk or the disco! Unfortunately it is sold out yet again. This is my version of day eye using date shadows. Don’t follow the rules. CHANTECAILLE CONCEALER BRUSH is a brilliant large acrylic brush for smoothing it’s way around the nooks and crannies that need concealing. A concealer brush is IMO the most important brush in your arsenal and I found this one at the Chantecaille counter in Fortnums where I normally only go to pick up tea and fruit jellies but as I’d recently come back to the UK I ventured up to the second floor. Some lovely makeup lines there so pop in if you are so inclined. This brush is nice and bendy, with a great handle for easy use and will be your new fave too if you give it a try. I got one for my kit and one for me because I love it so much. £30.00 at Fortnums and any Chantecaille counter. BENEFIT GALIFORNIA BLUSH arrived on March 29, just in time for Coachella . I had to have one (not that I could make it to Coachella, I was working) and made a dash to the shops to get it for a film I was on. It sits happily in my kit alongside it’s cheeky siblings from this Californian company. I’m not as obsessed by brows as benefit seems to have become, but I do think they do cheeks very well. Galifornia blends bright pink with shimmering gold and is very flattering on summer skin. I ended up loving it almost as much as the classic, everyone should have one, Dallas, which is a pinkish bronzer that is so natural compared to most of the bronzers out there. The newest blush from benefit comes with a cute little rounded brush for a perfect application. NARS Radiance Primer SPF35 launched January last year with two other new primers from this beauty giant and became a firm favourite. It really does impart a glow and feels great on if you have dry skin like I do. Wear it alone or under your cream or liquid foundation. It’s peachy toned, luscious and juicy, apply it with your fingertips and radiate. But not in a nuclear way. Added SPF35 helps protect you from that. TOM FORD STARTS GARDENING – the opening of the world’s first freestanding TOM FORD Beauty store in December in Covent Garden was big beauty news and I was lucky enough to get a sneak peek. It’s a modern, sleek environment as befits the brand and as well as being full of gorgeousness the store also offers makeup, grooming and bespoke perfume services. I could go a bit mad here so will limit my visits but am very fortunate that Santa really did read my list this year and put a couple of goodies under the tree for me. STILA MAGNIFICENT METALS GLITTER AND GLOW LIQUID EYE SHADOW – 2017 was a truly glittering year but now we know there’s a real price to pay for their beauty. I’m putting them on my list because they were big news in 2017 and back in February we didn’t have the information we have now. If you ever wear glitter you must be diligent in removing it, using an oil cleanser that the glitter will stick to so you can put the bits in the bin and not into the water supply. Have a drain catcher in your sink anyway. This glittering but sophisticated look, created by me using Stila Cosmetics Magnificent Metals Glitter & Glow Liquid Eye Shadow Smouldering Satin and Stila Cosmetics Magnificent Metals Glitter & Glow Liquid Eye Shadow Molten Midnight is a very good way to add some sparkle to your look and the Stila Metals are one of the easiest glitter shadows to use because of the sponge applicator. You have to get it on quick. I am especially fond of the lavender one but don’t know if I can use any of them again in good conscious. BURT’S BEES LIP CRAYONS There’s a reason crayons are loved the world over. Easy to use, colourful and sturdy, these ones from the U.S Natural Beauty Co. are lovely on and in a wonderful range of colours. They are beautifully sheer so if dark or bright colours aren’t usually your thing these are a good way to start trying them. The darkest colours are absolutely gorgeous on black women. O&M PROJECT SUKUROI GOLDEN SMOOTHING BALM is another product that was new to me in 2017, as was the whole Organic & Mineral line which I never came across in N America. This balm has saved my hair from some severe bad hair days and I may not be a hairdresser but I have A LOT of hair which I think makes me qualified to review hair stuff. Another great recommendation from SpaceNK in Brighton (which deserves a special shout-out. I am more often than not disappointed by service at makeup and beauty counters but the employees here, no matter their median age, know their stuff and are not pushy in the least). Add a good-sized golden blob (depending on how much hair you have) before blow drying and it will smooth it all out. The golden hue adds nice dimension and shine to any hair colour and it smells gorge too. O & M Project Sukuroi has taken my hair from straw to golden tresses on more than one occasion so it’s not a fluke, it’s a really good hair cream. At £30 a pot it’s worth it to me for good hair days and has lasted months. Before. The results of a very windy and rainy run on the beach! M.A.C HOLIDAY SNOWBALL COLLECTION – M.A.C gave us some sparklers for the 2017 holiday season in a collection worthy of Frosty. I caved and bought two eyeshadows, and a gorgeous (slightly) frosted bronze lipstick. The real beauty of these is that they can be worn all year for some subtle shine or bumped up for intense shimmer depending on the state of your eyelids. Holiday collections are designed with gifting in mind but are also good to share for party season if you’re so inclined. Most of the collection sold out very quickly but there are some nice bits left if you’re curious. One light, one dark, can be sheer or dramatic depending on your application technique. EYELASH PERMING – having a lash perm as a base for any other lash treatments (extensions, individual temporary lashes, full set of false eyelashes) makes them look better because the lashes curve in the right direction. A lash perm on it’s own is a fantastic eye-opener that looks natural and not Kardashian, you know what I’m talking about. I did love lash extensions but a lash perm is less upkeep and you can still use your regular mascara. An easy process that takes about an hour and a half it’s a beauty investment as far as I’m concerned. Get a tint at the same time and you no longer have to worry about morning guinea-pig eyes. You know, the look before mascara’s applied. Be sure to find a really good practitioner and do a patch test first. I was going to the The Beauty Corner in Vancouver (booking my summer appointment soon!) but will have to find a good place near Brighton. I’m asking around. M.A.C ROLLERWHEEL LIQUID LINER – I WISH I could have reviewed this one but I walked out M.A.C on Robson in Vancouver without one on it’s first release, don’t know why I just didn’t buy it, and when I went back it was gone. Haven’t seen it anywhere since though rumours are it’s coming back. An interesting concept and one I would have liked to have tested. It won an Allure Award so fingers crossed for a return of the wheel because as of yet I can’t say if it’s a unique way to apply liner or a beauty gimmick. M&S BEAUTY ULTIMATE SLEEP CREAM which you’ve all probably heard of by now because India Knight got to it long before I did. I found it during a bad bout of jet lag, drawn by the BIG claim “skin looks like you’ve had 8 hours sleep (even when you haven’t )”. It’s a rich, dependable night cream that didn’t exactly make me an overnight sensation but is very good for the price and reminded me of Tilbury’s night cream. I love it as a night hand cream and on the décolletage. Charlotte Tilbury Instant Look In A Palette Beauty Glow Makeup Palette was yet another beautiful palette from 2017 and her most natural so far. Even my non-makeupey friends like this one. Pop it in your handbag for work and weekend trips, it’s a pretty collection with three very useable eyeshadows, one sculpt, one highlight and two blush colours. A good investment that will give you a lot of mileage. MARKS AND SPENCER AUTOGRAPH LINE COMPLEXION PRIMERS – another very good find in the M&S beauty aisles, there’s a primer for everyone and extremely competitively priced, not forgetting the beauty sales that are regularly on. I use the DD Daily Defence anti-pollution primer with SPF for days in London and the Hydrating for no-makeup days when I want to save my more expensive ones. NARS LA PLAGE BRONZING AND HIGHLIGHTING PALETTE – I’m not a fan of severe contouring and strobing but there are products that will do it in a pretty way and this is one of them. It has two very flattering, easy matte bronzers (cult classic Laguna is included) with four soft shimmery tones which add a nice bounce on summer nights, just don’t go too hard with them. Although the shimmers can be water activated, that will really bump up the impact and IMO a single sweep with a big brush is all you need. You can also use any of the six shades on your eyes so this one is excellent for holiday makeup bags. The La Plage palette, released in July, was a Nordstrom Exclusive in North America and didn’t last long so I’m glad I got one of these for the kit. There are a few of them still around but you might have to search. Oh I do like to be beside the seaside. So would you, in these amazing beach tones with a little glimmer for summer nights. So that’s it, many more than 17 and I ran out of time before I ran out of things to tell you about. Just so you know, I bought and tried every single thing on the list out of my own pocket, and wouldn’t recommend anything I didn’t believe could give you your best face forward. Wishing you a healthy, happy, confident and beautiful 2018. And there’s a prize if you kept any of these…I blame everything on 17, it’s where my lipstick obsession began!